When a business client heard about Suzanne Giesemann’s first book, The Priest and the Medium, he was taken aback and asked somewhat cynically if she was really into that “stuff.” She responded that she surely is. “If he’d asked me the same question a couple of weeks earlier, I might have waffled,” Suzanne told me in a November 2010 interview, explaining that she was concerned that some people might think she had lost a few marbles since her retirement from the Navy seven years earlier. Now, a decade or so and seven metaphysical books later, she’s still very much into it. In fact, she is one of the most sought-after speakers on the spirituality and consciousness conference circuit, not just as an author but as a highly regarded medium. “My life has become an ongoing exploration of a greater reality,” she states in the Preface of her latest book, Still Right Here: A True Story of Healing and Hope, going on to explain that it all started with the 2006 death of her stepdaughter, Susan, who was struck by lightning. It was Susan’s passing that led to her search for the truth of life after death, meeting Anne Gehman, the medium in that first book, and ultimately to the discovery of her mediumistic abilities. Before that, Suzanne (below) had a pretty “straight-laced” background, serving 20 years in the U.S. Navy, including as a commanding officer, a special assistant to the Chief of Naval Operations, and aide to the Chairman of the Joint Chiefs of Staff. Along the way, Commander Giesemann earned a master’s degree in National Security Affairs, taught political science at the Naval Academy, and traveled to 56 countries. Her husband, Ty, is a retired U. S. Navy captain. She began developing as a medium after meeting Gehman and several other mediums who provided evidence of Susan’s survival. That prompted her to take several classes in mediumship and an intensive course on the subject at Arthur Findlay College in England. It was while meditating on her sailboat one day in 2009 that she felt the need to pick up a notebook and start writing. Words started flowing without her thinking. “They came so quickly that I didn’t have time to think,” she further explained in that 2010 interview. “I just kept writing and realized, ‘They’ve sent me a poet!’” She filled page after page without opening her eyes. She could tell it made sense, but she had no sense of the content as a whole, and she was certain the words hadn’t come from her conscious mind. A year or so later, while in an altered state, Suzanne began bringing through messages from an entity named Sanaya, who identified “themselves” as a collective consciousness of minds with both feminine and masculine energy from a higher dimension than our own. Sanaya has delivered thousands of messages to date (see https://www.suzannegiesemann.com/). Suzanne, are you aware of what you are saying while in this altered state? Do some of the ideas expressed by Sanaya differ from your own? I channel Sanaya from an altered state, but I am still somewhat aware of the concepts as they come through me, if not each word. Yes, they have definitely shared information that was contrary to my personal belief system, and I have subsequently changed my views based on their teaching. By the way, it was several years after Sanaya instructed me to call them by that name that I learned Sanaya is an Arabic girl’s name meaning “flash of lightning.” This is amazingly ironic, considering a flash of lightning is what killed my stepdaughter Susan and the young man I wrote about in my book, Wolf’s Message. Psychologists and many parapsychologists would say it is all coming from your subconscious mind. How do you respond to them? Sanaya has taught me that there is only one Mind projecting consciousness through multiple realities. I believe their words come from a superconscious level of mind and are filtered through my subconscious mind. It is a cooperative experience and I have stopped asking if it is real or unreal. The only question that matters to Sanaya and to me is, “Is it useful?” Those who experience the energy and the words during these sessions are uplifted and they learn new perspectives, resulting in greater love and compassion in our world. Some have even been healed of physical ailments during the channeling sessions. I can’t prove where this is coming from, but it is highly useful to the Whole, so I continue the practice. I understand that clairvoyance/clairaudience and trance mediumship are two different types of phenomenon and that you experience both. Would you mind explaining the difference? When I merge my awareness with that of a discarnate being in a mediumship sitting, I experience their presence through visual images (clairvoyance), hearing words or thoughts (clairaudience/claircognizance), as well as feeling their emotions and their presence (clairsentience). In the deeper altered state from which I channel Sanaya, the words simply flow without time or need to interpret the information. I experience a seamless blending without images or any seeming separation, yet I most certainly feel the power of their presence. I would like to point out that I no longer need to be in a deeply altered state to access Sanaya’s guidance. These days I merely shift my focus with the intention of connecting with my Team and I instantly become aware of them. This kind of connection with guides is possible for anyone, since we are all expressions of Consciousness, just as our guides are. Once a person comes to know how it feels to be in a state of focused awareness, anyone can shift their focus and gain a higher perspective on our human issues. The reason I enjoy the channeling sessions so much more than simply checking in with them throughout the day is that once I enter into the deeper states of awareness, I can maintain that connection with Sanaya without the distractions of the physical world. The “collective consciousness” calling itself Sanaya seems to be what was called a “group soul” with other mediums. Imperator and his band of 49 who communicated through William Stainton Moses a century ago immediately comes to mind, as does Jane Roberts’s Seth. Do you think we are talking about the same thing? I do. I have read and listened to the channeled materials of Jane Roberts and others such as Paul Selig and Esther Hicks. Just as a sensitive person can feel the energy or level of consciousness of an author when we read books written by contemporary authors, the channeled works of these well-known channelers all have a similar “energy” or feel to me. The basic messages coming from Sanaya seem to be about love and forgiveness. How much is there to say about those subjects? Is what “they” are now saying different than what they said seven or eight years ago? There is no change at all in their teaching. In fact, they have told us many times that there is nothing new under the sun in this regard and that we cannot hear these messages of love and the soul’s evolution too often. All we have to do is read the headlines each day to see that there is still plenty of learning to be had in this Earth School. Given all the chaos and turmoil in the world today, do you think we are making any progress in overcoming our materialistic and hedonistic ways? I believe that ever so slowly, we are making progress. Sanaya repeatedly tells us not to be discouraged. They point out that we have progressed from the Dark Ages to our current era, which they jokingly refer to as the “Dim Ages.” In the grand scheme of things, this is an improvement, but we have a long way to go until the majority of humans understand that we are here to learn to extend not fear, anger, and hatred, but love. Do you have a preference between channeling Sanaya and mental mediumship? I love them both. Thanks to the Internet, channeling Sanaya helps us to send ripples to a large number of people around the world, but there is nothing like being one-on-one with someone in my private sittings and providing them with evidence that their loved ones who have passed are right there with us. The kind of verifiable information that those in spirit are able to get through in those sessions is wondrous and can be incredibly healing. I’ve seen people’s grief be transformed in one hour when family members go from despair to the stunning awareness their loved ones live on across the veil. You’ve come a long way since our interview in 2010. 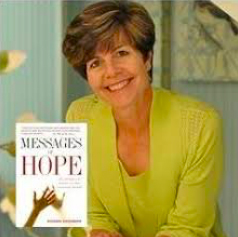 You now lead webinars and classes and host an online radio show on Unity FM with the same name as your memoir, Messages of Hope (see http://www.SuzanneGiesemann.com/radioshow) Did you foresee any of this when you wrote your first book about mediumship? I truly did not, and it’s the greatest honor I can imagine to serve in this way. When I interviewed Anne Gehman for The Priest and the Medium, I didn’t have any idea that I would one day be a medium myself. Because my waiting list for readings is over three years long now, I offer classes, workshops, webinars, online courses, and CDs to help others connect across the veil themselves. I work harder these days than I ever did in my Navy career, even when I was assigned to the Pentagon working what my husband calls “half days” (6 AM to 6 PM) as aide to the Chairman of the Joint Chiefs! Honestly, though, I wouldn’t change a thing. I have the most supportive husband in the world, and I love my life with Ty and our two longhaired dachshunds. I have no idea! I used to be a big goal setter and I had to have everything planned out in great detail, but Sanaya has taught me how much better things turn out when we allow ourselves to be guided moment to moment by Higher Consciousness. These days, I’m very happy to simply follow orders from Spirit. Of course, I still exercise my free will, but it’s a very peaceful, freeing way to live once you stop striving and allow yourself to be guided. I want to help as many people as possible to know the peace and joy that come from awakening to the fact that we are never alone and that what connects us all is love. Graham, you sound like you have similar concerns to mine. I just finished reading, “Demystifying the Out of Body Experience” by Luis Minero and found it the most satisfying book I have yet read in regard to the issues you raised. Although going out of the body is the focus, in many ways it is a very small part of what Mr. Minero’s book deals with. OBE’s happen to be the way they (the International Academy of Consciousness) do their research into, among other things, how to best approach getting help from the other side in order to fulfill our spiritual commitments here on earth. They approach these matters very rationally, and as a result, I found myself nodding in agreement and thinking “Aha!” page after page. I have not read Suzanne’s book, but it sounds like she is—at the very least—doing important work in validating the reality of all this. I would be interested in hearing if she and her guide point to answers to some of your (our) specific concerns as the book goes on. In any case, thank you Suzanne! We need level-headed and apparently interesting spokespeople like yourself! Having started to read Suzanne’s Awakening free download, seems to be more of survival after death. What really interests me is how we set up our time here, what agenda do we sign up for? My current understanding is that we have a spirit guide or two helping us to fulfill whatever it is we agreed to, and in most cases promptly forgot about, after the portion of our soul that melds with a human body is temporarily separated from the awareness it usually enjoys. Suzanne is always a joy to listen to. I look forward to our next meeting. This is another fascinating article by Michael Tymn. I bought and read his book, “Resurrecting Leonora Piper: How Science Discovered the Afterlife,” and now consider it one of the best books I’ve read on the subject. I do believe we are meant to be listening to higher levels of consciousness. I’m not sure that we should concern ourselves too much about it, but be open to it, and even encourage it through mindfulness, meditation, and contemplation. The link to Suzanne’s site doesn’t work as there is an extra ‘n’ in it. Great article though, I have come across a couple of trance mediums recently, may their number increase, or whatever way is best for helping us.